How Much Does A Breast Implant Weigh? The breast augmentation consultation includes a detailed discussion and comparison of saline-filled and silicone gel-filled breast implants. To help appreciate the differences between the two implants, woman have the opportunity to handle the implants and feel the characteristics of each. Both implants have a shell made of a silicone elastomer, but the fluid (wave) consistency of the saline implant is quite different from the (cohesive) gel consistency of the silicone implant. After feeling the implants, some women comment that they believe the silicone gel breast implant feels heavier than a saline-filled breast implant. Despite the apparent difference, the implants are very similar in weight. In addition, saline and silicone implants weigh about the same as breast tissue. The density of the 0.9% saline used to fill the implant is about 1.005 gr/cm3. Two 300 cc Saline-filled breast implants therefore weigh 603 gr. 603 gr / 454 gr = 1.328 pounds = 1 pound 5.25 ounces. This photograph shows the weight of a moderate profile 304cc silicone gel-filled breast implant. The weight of this implant is 306 grams. Using the estimated density of silicone gel (0.97gr/cc), a 304cc silicone gel implant should weigh about 295 grams. This would suggest that the implant shell weighs about 12 grams. The density of the silicone used to fill the breast implant is about 0.98 gr/cm3. Two 300 cc Silicone gel-filled breast implants therefore weigh 582 gr. 582 gr / 454 gr = 1.282 pounds = 1 pound 4.5 ounces. This demonstrates that a silicone gel breast implant is actually just slightly lighter than an equal volume saline breast implant. Hw much is the weight of 3 size of silicon breast implant and one will get neck and back pain after ha ing silicon breast implant. A 300cc silicone gel breast implant weighs just over 10 ounces, which is just under 2/3 of a pound. This volume is quite popular and falls within a range of implant volumes (between 250mL and 350mL) that are common for many women who desire a full, but natural, augmentation. Women who have augmentation surgery with implant volumes in this range do not experience neck or back pain post-operatively. So please tel me how much for 2 x 275cc silicone weighs in kg please ?? 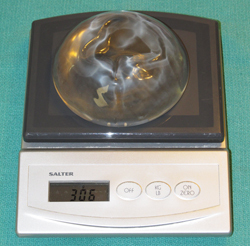 Two 275 cc Silicone gel-filled breast implants therefore weigh 533.5 gr. 533.5 gr / 454 gr = 1.175 pounds = 1 pound 2.8 ounces. The above calculation is an estimate and excludes the weight of the shells which might add 30(+) gr each to the overall weight. Thank you for the information! Would you please be able to tell how much would two (2) 550cc silicone gel implants weigh – including the shell, more or less? Two 550 cc Silicone gel-filled breast implants therefore weigh 1067 gr. 1067 gr / 454 gr = 2.35 pounds = 2 pounds 5.6 ounces. The above calculation is an estimate and excludes the weight of the shells which will likely add more than 30 gr each to the overall weight. This adds an additional 2 ounces, making the overall weight approximately 2 pounds 8 ounces (2.5 pounds). Two 640 cc Silicone gel-filled breast implants therefore weigh 1240 gr. 1240 gr / 454 gr = 2.73 pounds = 2 pounds 11.7 ounces. Pain could be caused my any number of things. I dont think the size of an implant is necessarily related to/the direct cause of breast pain, but if the implants are over-sized or not in the proper position then they may contribute to, or cause, pain. You should speak to your physician about this since the doctors you are working with know your situation best. Best wishes.